You're a sports fan. You know that The Derby is a big deal, only because you have always been told that it is really important. But what's the big deal? You don't really get it - to you it's just a horse race like any other, because no one has ever taken the time to explain to you WHY it is so celebrated by the horse racing masses. That's where I come in. The 1st of several installments. The title of this post is the tagline CBS uses to hype The Masters each year, but consider this: when the very first Masters was played way back in 1933, The Kentucky Derby had already been run annually for 58 years. When Fenway Park was opened in 1912, The Derby had already been run 37 times. World Series, initiated in 1903? The Derby's got that beat by 28 years, and every single one has taken place at the same venue. When the Derby started there were no cars: horses weren't just for racing, they were the prevalent mode of transportation for the industrialized world. You get the idea. This year will be the 132nd consecutive running of The Kentucky Derby, making it the oldest sporting event in North America. 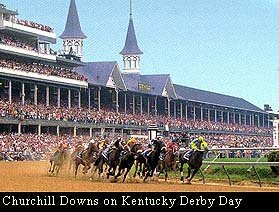 As I have written before, when you go to Churchill Downs on Derby Day, you can feel the history and tradition dripping all over the place, and you are overcome with the really cool feeling that you are experiencing someting very similar to what your grandfather and great grandfather before him experinced. I have felt this in my experiences at Fenway park and at Augusta National, but at the Derby you feel it moreso just because the same race has been run at the same track since 1875. You can talk to your grandfather about going to the Derby, as I used to do, and he will tell you about when he went back in the 60s or 70s, and the experiences you describe to each other are not very dissimmilar at all. History connects you to all that have gone before you, and here moreso than anywhere else on this side of the Atlantic. This alone makes the Derby special, but we're only just getting started. What you have said about The Kentucky Derby is true in America but there is a much bigger Horse Racing World out there beyond the Lower 48. Suggest you Google The Queen's Plate, The Melbourne Cup and HK Cup to see how rich and old they are. Thanks kiwipower. Yes, I am aware that the Kentucky Derby is not oldest in the world, I was speaking in the context of American sports. Thanks for the heads up though. I am aware of those events you mentioned, but one day when I have some free time I'll read up on them and learn more.